The Total-Nutrition Program is the most complete encapsulated 100% natural whole food multi-vitamins multi-mineral program with 17 digestive enzymes pre-biotics and probiotics. The Total-Nutrition Program™ is a multi-vitamin multi-mineral enzyme formula designed to provide complete nutrition for people of all ages. This proprietary blend has been created using the latest scientific research and using only whole food vitamin sources many of which are organic. It does not contain any synthetic or isolated crystalline vitamins or non-chelated minerals making it a truly natural and highly nutritional addition to anyone’s dietary program. Is a blend of Certified Organic Guava and Lemon extracts. All Organic, Kosher and 100% Natural Vitamin B1, B2, B3, B5, B6, B9 along with co-nutrients and Vitamin B12. Like all of NWC Naturals® products, we guaranteed maximum nutritional benefit and cellular delivery with L.E.A.D.S® Live Enzyme Activated Delivery System®. L.E.A.D.S.® is a proprietary blend of enzymes and chelated minerals that insure digestion and delivery of all the nutrients in the Total-Nutrition Program™ on a cellular basis. Total-Nutrition Program™ is has the six basic nutritional needs that we must consume on a daily basis are vitamins, minerals, essential fatty acids, antioxidants, enzymes, pre-biotics and pro-biotics. Whole food vitamins are essential and are required for good health and energy production. The complete spectrum of B vitamins from whole food sources supports energy production and normal hormone balance. Minerals from patented amino-acid chelates promote stronger bones, healthy hair, skin and nails, and help to maintain firm muscle tone. Antioxidants (vitamins A, C, and E) from whole food sources are the most valuable free-radical fighters to support your immune system. Digestive enzymes are essential for digesting and delivering the food we eat at every meal. We have included in this formula now 17 digestive enzymes so that you may digest your entire meal completely. ProBiotics are also known as friendly flora. They build and support the immune system while aiding digestion and delivery of important food nutrients and minerals. Pro-biotics also support a healthy gut. A full day's supply of Total-Nutrition Program™ (nine capsules) supplies 1.8 billion CFUs (colony forming units) of Acidophilus and Bifidum Bacteria. Pre-biotics- Inulin IQ FOS (Fructooligosaccharides)- one of the best-known pre-biotics, is a class of simple carbohydrates found naturally in certain plants, such as Jerusalem artichokes, onions, and bananas. FOS is known to promote the growth of beneficial bacteria in the gastrointestinal tract. It has been shown to stimulate growth of bifidobacteria in the colon. Supplementing with FOS can greatly support metabolic activity in the colon and help relieve constipation and reduce the production of intestinal putrefactive substances. 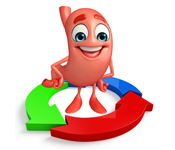 Healthy colon function is vital to a properly functioning immune system. A combination of the enzyme lipase and chelated chromium is the most effective natural way to support energy production and the elimination of excess fat. Calcium and Magnesium- both play an important role in muscle and bone building, while assisting with the metabolism of carbohydrates. These minerals also play a key role in maintaining overall health during periods of weight loss. Manganese- helps with the synthesis of fatty acids and cholesterol. It is vital to proper protein, carbohydrate and fat assimilation. Manganese also works to support healthy blood sugar levels, energy production and overall well-being. Zinc- is a trace mineral involved in digestion and metabolism. It is a component of insulin, playing a significant role in carbohydrate digestion. Chromium and Vanadium- are support minerals that aids in cellular metabolism. It is included in the formula to help establish overall body balancing for effective weight management and support healthy blood sugar levels. Magnesium Glycyl Glutamine chelate- The MGG™ chelate is the only stabilized glutamine in the world, protected by an exclusive patent. Glutamine is an amino acid that serves as a necessary building block for protein in the body. It is also the amino acid lost in the greatest quantity during strenuous exercise. Although L-glutamine may be listed as an ingredient in some powdered formulas, it is known to decompose in the digestive tract and may be destroyed by various processing steps. We recognized the necessity of having a stabilized form of supplemental glutamine, so we at NWC use only the patented stabilized glutamine. Magnesium Glycyl Glutamine (MGG™) is the world’s only stabilized glutamine. Creatine MagnaPower- provides cellular fuel and acts as an “energy buffer”. Creatine is stored in cells as phosphocreatine (PCr), which plays a vital role in energy production by recycling ATP (Adenosine Triphosphate). ATP is what cells use for energy and is required for all cellular functions including muscle contraction, DNA synthesis and protein synthesis. When ATP is depleted, the cell no longer has energy to perform its functions. When combined with proper exercise, creatine supplementation can effectively increase strength, speed and power. This product is an Albion Gold Medallion award winner for outstanding mineral nutrition. It contains 100% patented amino acid chelates from Albion advanced nutrition, the world leader in mineral nutrition. Our capsules do not contain any, chemicals, gluten, dairy, eggs, preservatives, corn, artificial coloring or flavoring. All Natural Ingredients are Non-GMO. Our facility that manufactures our formula is certified and in full compliance with GMP Requirements for Dietary Supplements. We also utilize a third party testing lab that insures that all our quality ingredients are tested and retested for purity and quality. All NWC Naturals® products are Made and bottled in a USA facility. NOT ALL SUPPLEMENTS ARE A LIKE. LEARN WHAT YOU ARE GIVING YOUR FAMILY. Read this before you buy ANY vitamin or supplements. We try everyday to try to get Chemicals and toxins out of what we are eating, drinking, and our environment. Then we think we are doing well by buying a so called all natural supplements. The conscientious consumer knows just how important it is to make safe, natural choices in today's ever more chemical world. All of this information goes for your pet supplements too! Do not give your pets chemical supplements! People need to understand the difference between vitamins and supplements that are in pill form versus vitamins that are contained within nature's foods. Synthetic Vitamins just do not work like foods, and foods are what our bodies recognized, and designed to use for healing, prevention and energy. There is no substitute, and no matter how you look at it, vitamin pills are manufactured by scientists, so they are prone to cause side effects and are incomplete. A big red flag is if your vitamin is not their original form. Nature got it right; we just want to give it to you in a convenient capsule! Become a more informed consumer. 1) Foods contain not just vitamins, but the cofactors and helper nutrients that allow vitamins to work. 2) Foods are never found in high potency, so you won't suffer any toxic side effects that have been proven to exist with all chemical vitamin pills. 3) Whole foods never deliver toxic doses [of vitamins] in its original form. 4) Vitamins are just a small part of what our bodies require for health and healing. What is the label claim game? Consumers should be skeptical about natural claims. Sifting through false claims and misleading advertising might be frustrating, the conscientious consumer knows just how important it is to make safe, natural choices in today's ever more chemical world. So why isn't all-natural whole-food vitamins used in most nutritional supplements? Primarily due to their higher cost and the challenge they present in the nutritional "label wars" game. For example, Amla and Acerola Cherry are vastly superior sources of vitamin C than ascorbic acid. But they cost 10 to 20 times more per mg.! What’s more, only small dosages are needed to fulfill the bodies’ needs verses the huge doses of ascorbic acid needed, and therefore they don't "compare" well on the federally regulated nutritional supplement label. Can you imagine the difficulty in convincing a novice vitamin buyer that 25 mg. of Amla is better for their body than 1000 mg. of ascorbic acid? Yet it's true. Unfortunately not many manufacturers are willing to go through the effort necessary to educate the consumer on why he or she should take all-natural whole-food supplements when they cost more, and seemingly "appear to deliver less." 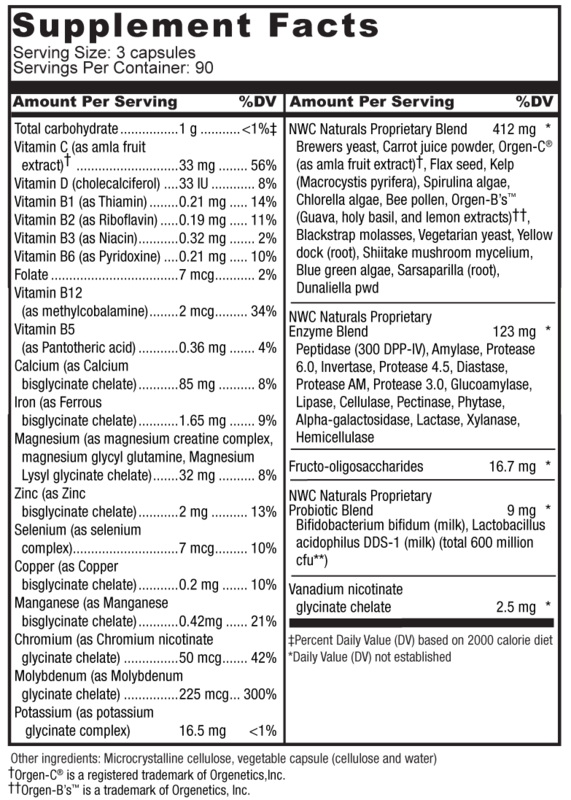 NWC Naturals® Proprietary Blend : Brewers yeast, Carrot juice powder, Orgen-C® (as amla fruit extract)†, Flax seed, Kelp (Macrocystis pyrifera), Spirulina algae, Chlorella algae, Bee pollen, Orgen-B’s™ (Guava, holy basil, and lemon extracts)††, Blackstrap molasses, Vegetarian yeast, Yellow dock (root), Shiitake mushroom mycelium, Blue green algae, Sarsaparilla (root), Dunaliella powder, Vitamin D 3 – (cholecalciferol). Also Pre-Biotics: Fructo-oligosaccharides from The root of the chicory plant. Vanadium nicotinate glycinate chelate. Calcium, Magnesium, Manganese, Zinc, Vanadium, Magnesium Glycyl Glutamine Chelate, Glutamine, Vanadium and Copper, Chromium. Other ingredients: Microcrystalline cellulose, Vegetable cellulose. †Orgen-C® is a registered trademark of Orgenetics Inc.
††Orgen-B’s™ is a trademark of Orgenetics Inc.
Vitamin D 3 – (cholecalciferol) is a fat-soluble vitamin that helps your body absorb calcium and phosphorus. Having the right amount of vitamin D, calcium, and phosphorus is important for building and keeping strong bones. Brewer’s yeast and vegetarian yeast: it is a good source of nutrients. Has: Thiamine (Vitamin B1), Riboflavin (Vitamin B2), Niacin (Vitamin B3), Pantothenic acid (Vitamin B5), Pyridoxine (Vitamin B6), Biotin (Vitamin B7 or Vitamin H),and Folic acid (Vitamin B9). Organic vitamin C: from Amla fruit. Chlorella Algae: chlorella is a powerful natural food you can take daily to support your immune system function. Blackstrap Molasses: contains vital vitamins and minerals, such as iron, calcium, magnesium, vitamin B6, and selenium. Yellow Dock Root: stimulates bile production, which helps digestion, particularly of fats. Sarsaparilla (root): Sarsaparilla is also nutritious and contains vitamins A, B-complex, C and D, and minerals iron, manganese, sodium, silicon, sulfur, copper, Zinc, and iodine. Bee Pollen: is nature’s most complete food. It contains over 5,000 enzymes, B complex vitamins and also vitamins A, C, D and E, as well as a variety of anti-bodies all in one “complete food.” It is now being recognized by scientists throughout the world as a substance that can help promote a youthful feeling, build resistance to ailments, help boost healing powers and provide dynamic energy. Flax Seed: is nature’s most abundant source of Omega 3 fatty acids and is known to be a rich source of “lignans”, a constituent of fiber that promotes a strong immune system and antioxidant effects in the body. It is helpful for supporting the immune functions and supports a healthy cardiovascular function. Shitake Mushroom: extracts from this mushroom have been shown to help with immune system function. Lentinan, which is technically classified as a polysaccharide and referred to as a branched beta-glucan, has also been shown to have immune supporting activity. Shiitake has been historically used in the Orient for supporting normal blood pressure and maintaining healthy cholesterol levels. It is also a great source of natural vitamin D.
Carrot Juice Powder: contains many important nutrients, such as beta-carotene and other carotenoids, B vitamins, vitamin C, the minerals calcium and potassium and much more. This is a potent antioxidant! Dunaliella Powder: one of nature’s richest sources of natural beta-carotene and contains many of the carotenoids commonly found in fruit and vegetables. Three servings of the Total-Nutrition Program™ supplies you with over 25% of the daily value of ALL of the essential minerals plus all of the essential trace minerals from plant sources and sea vegetables. Calcium and Magnesium - both play an important role in muscle and bone building, while assisting with the metabolism of carbohydrates. These minerals also play a key role in maintaining overall health during periods of weight loss. Manganese - helps with the synthesis of fatty acids and cholesterol. It is vital to proper protein, carbohydrate and fat assimilation. Manganese also works to support healthy blood sugar levels, energy production and overall well-being. Zinc - is a trace mineral involved in the digestion and metabolism of food. It is a component of insulin, playing a significant role in carbohydrate digestion. The immune system is adversely affected by even moderate degrees of zinc deficiency. Vanadium - is a support mineral that aids in cellular metabolism. It is included in the formula to help establish overall body balancing for effective weight management. Magnesium Glycyl Glutamine Chelate - is the only stabilized glutamine in the world, protected by an exclusive patent. Glutamine- is an amino acid that serves as a necessary building block for protein in the body. It is also the amino acid lost in the greatest quantity during strenuous exercise. In fact, countless research has shown that glutamine is consistently deficient in athletes during and after exercise sessions. When an individual is in a catabolic state due to strenuous physical activity or nutritional imbalances, glutamine homeostasis can be compromised. Supplemental glutamine is required to restore plasma glutamine levels, protect glutamine stores, and help conserve lean muscle mass. Free-form glutamine is not stable in solutions and may decompose into pyroglutamic acid and toxic ammonia. Although L-glutamine may be listed as an ingredient in some powdered formulas, it is known to decompose in the digestive tract and may be destroyed by various processing steps. We recognize the necessity of having a stabilized form of supplemental glutamine so we, at NWC, only use the parented Magnesium Glycyl Glutamine (MGG™). Creatine Magna-Power - is one of the ingredients in Total-Nutrition Program™ because it provides cellular. When combined with proper exercise, Creatine supplementation can effectively increase strength, speed and power. Protease AM - NEW Protease AM, Expo-peptidase and Dipeptidyl Peptidase IV to Help Support Digestion of Gluten. Amylase - amylase refers to a group of enzymes that breaks down sugars and starches. They are required to digest carbohydrates (polysaccharides) into smaller units (disaccharides), and eventually converting them into even smaller units (monosaccharide) such as glucose. PA-L ® - Vegetarian alternative that mimics pancreatin, with lipase. Invertase - this enzyme breaks down carbohydrates, especially sucrose. Diastase-is an enzyme that is the catalyst in the hydrolysis of disaccharide maltose to the simple sugar form – glucose. When starch is eaten, it is partially digested and transformed to maltose by both the saliva enzymes and pancreatic enzymes called amylases. The maltase secreted in the intestines converts this maltose into the usable sugar, glucose. The glucose can be used immediately or stored in the liver for future use. Protease 3.0, Protease 6.0 and Protease 4.5 - proteases refers to a group of enzymes whose function is to break down proteins; they are also referred to as proteolytic enzymes or proteinases. The proteins are broken down to their basic building blocks - amino acids. In order to have the amino acids available to the body, these enzymes have to break down the proteins to free them. This important compound is the key to digestive health. Total Nutrition Program ™ formula contains three different proteases. Glucoamylase - is used to breakdown carbohydrates, specifically polysaccharides. Peptidase (DPP-IV) - It seems reasonable that if supplemental DPP IV and DCP 1 were ingested in conjunction with a gluten containing food, the protein could be efficiently broken down prior to the entrance into the small intestine. Cellulase and Pectinase -help digest protein molecules. Four varieties of protease enzymes have been combined in this formula to compensate for higher protein diets. Phytase - Commonly found in plant material, is a natural enzyme often used for breaking down and increasing the nutritional quality of grains, In addition, calcium, zinc, iron and magnesium are liberated making these essential minerals available as well. Alpha-galactosidase - Help digest simple and complex carbohydrates and starches, i.e. pastas, breads or starchy vegetables like potatoes. Xylanase and Hemicellulase- Specifically help with releasing fiber-bound minerals from plant sources. They have been included to aid in the digestion of herbal supplements. They are also great for vegetarian diets! Bifidobacterium bifidum - (probiotic) is a normal inhabitant of the intestines. Found in large numbers, especially in children and adolescents, the numbers of bifidobacteria decrease with age. B. bifidum helps detoxify the intestines and promote regular bowel movements. Lactobacillus Acidophilus -Acidophilus is the most effective pro-biotic strain. Called the "sticker strain," Acidophilus has the ability to actually cling to the intestinal wall without harming it. In fact, it is best known for its ability to move un-disrupted through the stomach and into the intestines where it eats away at the bad bacteria. It is known for reducing the occurrence of constipation and diarrhea, increasing nutrient uptake (especially calcium). Is a blend of Certified Organic Guava and Lemon extracts. All Organic, Kosher and 100% Natural Vitamin B1, B2, B3, B5, B6, B9 along with co-nutrients. Guavas are rich in nutrients including vitamins, carotenoids, polyphenols and antioxidant pigments. Guava is one of the more popular fruits in Africa, South Asia, and subtropical America and Australia. Has vitamin C, E,K, B6, Potassium, Folate, and more. Tulsi is a sacred plant for Hindus, and a very well documented medicinal plant in Ayurveda medicine as an "adaptogen" to counter life's stresses and support and normalize inflammation. Modern science confirmed that Holy Basil has nutrients like ursolic acid, rosmarinic acid, oealonic acid. Holy Basil is a very powerful antioxidant that contains folates B9, Niacin B3, vitamin K , C ,E and A. Also and excellent source of iron. Contains a good amount of minerals like potassium, manganese, copper, magnesium and more. Lemon is grown on an evergreen tree in Asia. Lemon peels are rich in vitamins, including folic acid and folates, a few other minerals, and phytosterols. Has vitamin B1, B2, B3, B6, Folate, vitamin C, A, E and more. (as methylcobalamine); Vitamin B12 is a water-soluble vitamin. Nutritional yeast products also contain vitamin B12. We use methylcobalamine the most sort after B-12 on the market. The B-support complex plays a vital role in energy production, maintaining a healthy nervous system and hormone balance. This whole food supplement is gentle on your stomach. Total-Nutrition Program™ is further enhanced with L.E.A.D.S. ®, Live Enzyme Activated Delivery System ®, to insure assimilation at a cellular level of all the nutrients in each capsule. Also, mineral co-factors help to activate each ingredient for maximum particle digestion and complete nutrient distribution throughout the body, thereby increasing the formula’s bioavailability. Take three with each meal. It contains all the digestive enzymes to digest your meal with pre-biotics and probiotics to complete the process and support your immune system. 1. What research has been done on the Total-Nutrition Program™? Over two years in development, the Total-Nutrition Program™ was formulated using the latest research and clinical studies. Each ingredient has been independently researched by the most respected names in their fields. The Total-Nutrition Program™ is a formulation you can trust because its ingredients are clinically tested and proven. The Total-Nutrition Program™ has no known side effects. Because it contains no stimulants, like caffeine or other harmful herbs, it will not make you nervous or jittery. And, there are NO harmful herbs or synthetic vitamins. The Total-Nutrition Program™ is safe for anyone ages 8 years and up. 3. If I am on medication, can I safely use this formula? The Total-Nutrition Program™ is safe to take with medications. There are no known drug interactions and the ingredients do not alter the action of any medications. 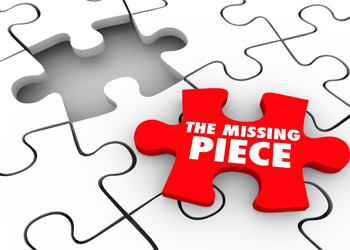 However, before beginning any program you should check with your personal physician. 4. Can I take the Total-Nutrition Program™ if I am a diabetic? While this formula is not specifically for diabetic conditions, it may help support healthy blood sugar levels. 5. Is this formula safe for pregnant or nursing women? Yes. It only contains whole food nutrition and all natural ingredients. However, you should always check with your doctor before taking any supplement if you are pregnant, nursing or are currently being treated for a condition. 6. I am allergic to gluten. Can I take this formula? Yes, the Total-Nutrition Program™ contains no gluten. 7. What is the best time to take the Total-Nutrition Program™? The best time to take the Total-Nutrition Program™ is with your food at every meal. This will digest your entire meal while enriching that meal with pro-biotics, vitamins, minerals, greens, super-antioxidants, essential fatty acids and trace minerals. 8. Why should I avoid carbonated beverages while taking the Total-Nutrition Program? Carbonation destroys the active digestive enzymes contained in the capsules and leaches calcium and other minerals from your system. Without these enzymes, the Total-Nutrition Program cannot properly digest your meals and deliver all the nutrition in the program. So, even diet sodas can sabotage your overall health. 9. If I only eat two meals a day should I skip a dose of the Total-Nutrition Program? NO, you will want to get the entire recommended nine capsules in each day. Take four capsules at lunch and then the five remaining at dinner. If you’re unable to take any of your Total-Nutrition Program™ capsules for the entire day, it’s perfectly fine to take all nine capsules with dinner. 10. My energy level seems higher while I am taking the Total-Nutrition Program™, is this common? YES! But remember, there are no drugs or stimulants in this formula. The boost in energy is a result of your body receiving a super dose of whole food nutrition including many enzymes responsible for stimulating your metabolic systems. When your body has optimal levels of good nutrients, it will give you a natural boost in energy and operate more efficiently.